Definition at line 22 of file CREMainWindow.h. Definition at line 25 of file CREMainWindow.cpp. References browsingFinished(), browsingMap(), createActions(), createMenus(), ResourcesManager::load(), MessageManager::loadMessages(), QuestManager::loadQuests(), myArea, myMapBrowseStatus, myMapManager, myMessageManager, myQuestManager, myResourcesManager, myScriptManager, and CREMapInformationManager::start(). Definition at line 333 of file CREMainWindow.cpp. References myClearMapCache, myMapBrowseStatus, myReportPlayer, myReportQuests, and myReportShops. Definition at line 328 of file CREMainWindow.cpp. Definition at line 56 of file CREMainWindow.cpp. References CREMapInformationManager::cancel(), cleanup(), myMapManager, myMessageManager, myQuestManager, and myResourcesManager. Referenced by doResourceWindow(), onSaveMessages(), and onSaveQuests(). Definition at line 67 of file CREMainWindow.cpp. 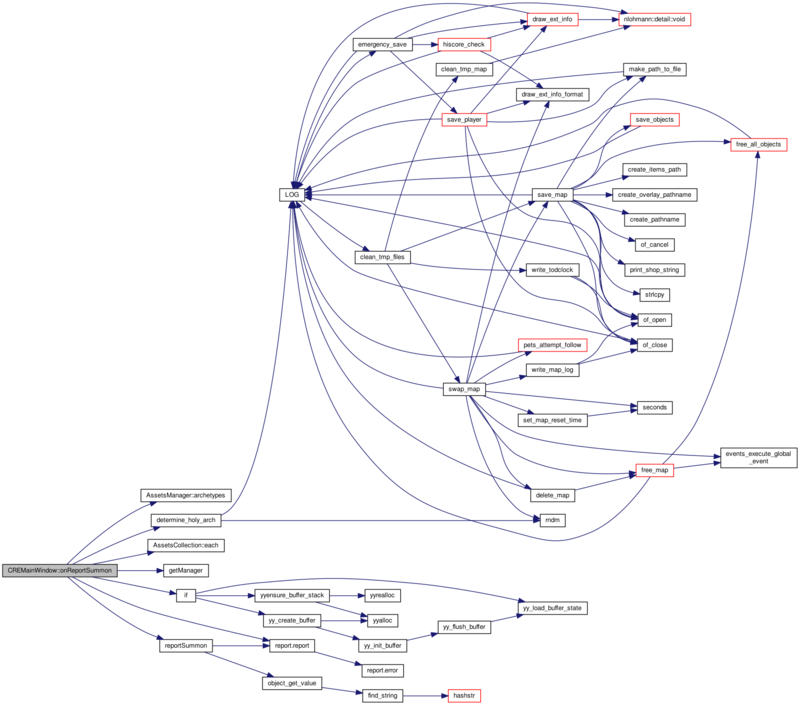 References myClearMapCache, myOpenAnimations, myOpenArchetypes, myOpenArtifacts, myOpenExperience, myOpenFaces, myOpenFormulae, myOpenMaps, myOpenMessages, myOpenQuests, myOpenRandomMaps, myOpenResources, myOpenScripts, myOpenTreasures, myReportAlchemy, myReportDuplicate, myReportPlayer, myReportQuests, myReportShops, myReportSpellDamage, myReportSpells, myReportSummon, mySaveFormulae, mySaveMessages, mySaveQuests, myToolCombatSimulator, myToolHPBar, myToolSmooth, onClearCache(), onOpenAnimations(), onOpenArchetypes(), onOpenArtifacts(), onOpenExperience(), onOpenFaces(), onOpenFormulae(), onOpenMaps(), onOpenMessages(), onOpenQuests(), onOpenRandomMaps(), onOpenResources(), onOpenScripts(), onOpenTreasures(), onReportAlchemy(), onReportDuplicate(), onReportPlayer(), onReportQuests(), onReportShops(), onReportSpellDamage(), onReportSpells(), onReportSummon(), onSaveFormulae(), onSaveMessages(), onSaveQuests(), onToolBarMaker(), onToolCombatSimulator(), and onToolSmooth(). Definition at line 190 of file CREMainWindow.cpp. 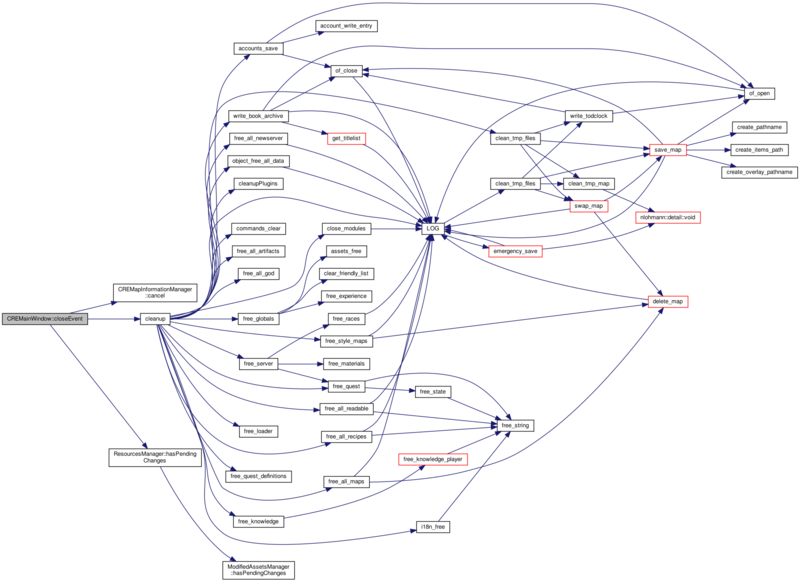 References myClearMapCache, myOpenAnimations, myOpenArchetypes, myOpenArtifacts, myOpenExperience, myOpenFaces, myOpenFormulae, myOpenMaps, myOpenMenu, myOpenMessages, myOpenQuests, myOpenRandomMaps, myOpenResources, myOpenScripts, myOpenTreasures, myReportAlchemy, myReportDuplicate, myReportPlayer, myReportQuests, myReportShops, myReportSpellDamage, myReportSpells, myReportSummon, mySaveFormulae, mySaveMenu, mySaveMessages, mySaveQuests, myToolCombatSimulator, myToolHPBar, and myToolSmooth. Definition at line 233 of file CREMainWindow.cpp. References commitData(), myArea, myMapManager, myMessageManager, myQuestManager, myResourcesManager, myScriptManager, onFiltersModified(), onReportsModified(), updateFilters(), and updateReports(). Referenced by onOpenAnimations(), onOpenArchetypes(), onOpenArtifacts(), onOpenFaces(), onOpenFormulae(), onOpenMaps(), onOpenMessages(), onOpenQuests(), onOpenRandomMaps(), onOpenResources(), onOpenScripts(), and onOpenTreasures(). Definition at line 1336 of file CREMainWindow.cpp. Definition at line 343 of file CREMainWindow.cpp. Definition at line 260 of file CREMainWindow.cpp. Definition at line 250 of file CREMainWindow.cpp. Definition at line 245 of file CREMainWindow.cpp. Definition at line 295 of file CREMainWindow.cpp. Definition at line 270 of file CREMainWindow.cpp. Definition at line 265 of file CREMainWindow.cpp. Definition at line 275 of file CREMainWindow.cpp. Definition at line 285 of file CREMainWindow.cpp. Definition at line 280 of file CREMainWindow.cpp. Definition at line 307 of file CREMainWindow.cpp. Definition at line 290 of file CREMainWindow.cpp. Definition at line 302 of file CREMainWindow.cpp. Definition at line 255 of file CREMainWindow.cpp. Definition at line 611 of file CREMainWindow.cpp. References alchemyTable(), archt::clone, first_archetype, obj::name, archt::next, SKILL, and obj::type. Definition at line 359 of file CREMainWindow.cpp. References ResourcesManager::allAnimations(), ResourcesManager::animation(), obj::animation_id, animations, archt::clone, obj::face, ResourcesManager::faces(), animations_struct::faces, first_archetype, first_artifactlist, artifactstruct::item, artifactliststruct::items, myResourcesManager, new_face_struct::name, animations_struct::name, obj::name, archt::name, artifactstruct::next, artifactliststruct::next, archt::next, animations_struct::num_animations, and object_get_value(). Generate and display a table reporting for each monster and skill at what level approximately the player could kill the monster. Definition at line 910 of file CREMainWindow.cpp. References archt::clone, first_archetype, FLAG_MONSTER, archt::head, liv::hp, IS_COMBAT_SKILL, monsterTable(), obj::name, archt::name, archt::next, QUERY_FLAG, SKILL, obj::stats, obj::subtype, and obj::type. Definition at line 1246 of file CREMainWindow.cpp. References Quest::code(), QuestManager::findByCode(), Settings::localdir, myQuestManager, Settings::playerdir, QuestManager::quests(), readDirectory(), settings, and Quest::title(). Definition at line 1155 of file CREMainWindow.cpp. References CREMapInformationManager::allMaps(), buildShopReport(), myMapManager, and CREMapInformation::shopItems(). Definition at line 348 of file CREMainWindow.cpp. Definition at line 489 of file CREMainWindow.cpp. References archt::clone, create_archetype(), liv::dam, first_archetype, obj::level, Settings::max_level, obj::name, archt::next, object_free_drop_inventory(), settings, obj::skill, SP_BULLET, SP_level_dam_adjust(), SP_level_spellpoint_cost(), SPELL, SPELL_GRACE, obj::stats, obj::subtype, and obj::type. Definition at line 670 of file CREMainWindow.cpp. References archt::clone, first_archetype, obj::name, archt::next, SKILL, spellsTable(), and obj::type. Definition at line 1038 of file CREMainWindow.cpp. References archt::clone, determine_holy_arch(), first_archetype, GOD, archt::next, reportSummon(), SP_SUMMON_GOLEM, and SPELL. Definition at line 312 of file CREMainWindow.cpp. Definition at line 322 of file CREMainWindow.cpp. References commitData(), myMessageManager, and MessageManager::saveMessages(). Definition at line 316 of file CREMainWindow.cpp. References commitData(), myQuestManager, and QuestManager::saveQuests(). Definition at line 1330 of file CREMainWindow.cpp. Definition at line 1324 of file CREMainWindow.cpp. Definition at line 1318 of file CREMainWindow.cpp. 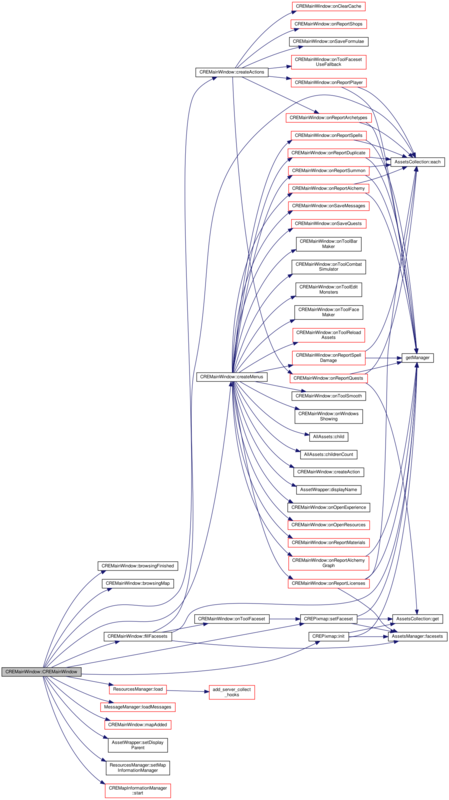 Referenced by doResourceWindow(), and onFiltersModified(). Referenced by doResourceWindow(), and onReportsModified(). Definition at line 35 of file CREMainWindow.h. Referenced by CREMainWindow(), doResourceWindow(), and onOpenExperience(). Definition at line 70 of file CREMainWindow.h. 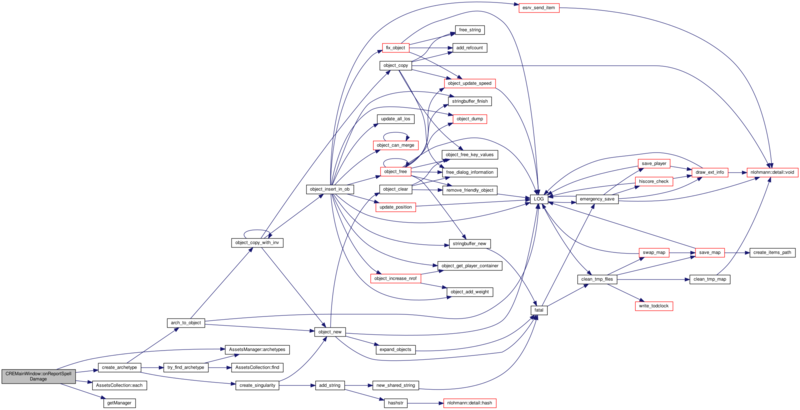 Referenced by browsingFinished(), createActions(), and createMenus(). Definition at line 71 of file CREMainWindow.h. Referenced by browsingFinished(), browsingMap(), and CREMainWindow(). Definition at line 72 of file CREMainWindow.h. Referenced by closeEvent(), CREMainWindow(), doResourceWindow(), onClearCache(), and onReportShops(). Definition at line 74 of file CREMainWindow.h. Referenced by closeEvent(), CREMainWindow(), doResourceWindow(), and onSaveMessages(). Definition at line 46 of file CREMainWindow.h. Definition at line 44 of file CREMainWindow.h. Definition at line 43 of file CREMainWindow.h. Definition at line 51 of file CREMainWindow.h. Definition at line 48 of file CREMainWindow.h. Definition at line 47 of file CREMainWindow.h. Definition at line 49 of file CREMainWindow.h. Definition at line 40 of file CREMainWindow.h. Definition at line 53 of file CREMainWindow.h. Definition at line 52 of file CREMainWindow.h. Definition at line 55 of file CREMainWindow.h. Definition at line 50 of file CREMainWindow.h. Definition at line 54 of file CREMainWindow.h. Definition at line 45 of file CREMainWindow.h. Definition at line 73 of file CREMainWindow.h. 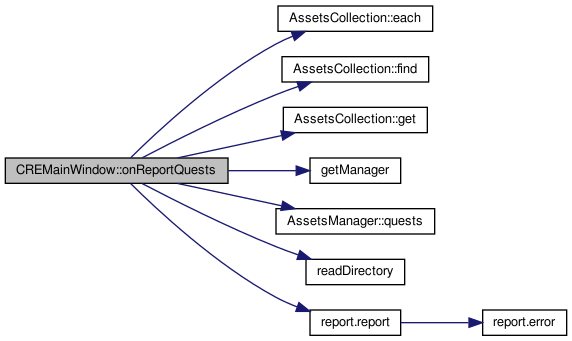 Referenced by closeEvent(), CREMainWindow(), doResourceWindow(), onReportQuests(), and onSaveQuests(). Definition at line 61 of file CREMainWindow.h. Definition at line 59 of file CREMainWindow.h. Definition at line 63 of file CREMainWindow.h. Definition at line 66 of file CREMainWindow.h. Definition at line 65 of file CREMainWindow.h. Definition at line 60 of file CREMainWindow.h. Definition at line 62 of file CREMainWindow.h. Definition at line 64 of file CREMainWindow.h. Definition at line 75 of file CREMainWindow.h. Referenced by closeEvent(), CREMainWindow(), doResourceWindow(), and onReportDuplicate(). Definition at line 56 of file CREMainWindow.h. Definition at line 41 of file CREMainWindow.h. Definition at line 58 of file CREMainWindow.h. Definition at line 57 of file CREMainWindow.h. Definition at line 76 of file CREMainWindow.h. Referenced by CREMainWindow(), and doResourceWindow(). Definition at line 69 of file CREMainWindow.h. Definition at line 68 of file CREMainWindow.h. Definition at line 67 of file CREMainWindow.h.